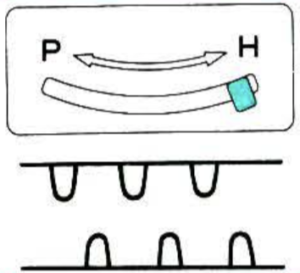 Some things to remember: when 2 carriages are selecting, each carriage needs to move far enough at the end of the needle bed so as not to be locked onto the belt. Extension rails are required. On the Brother ribber bed there are stops that keep the combined carriages from going off the beds. 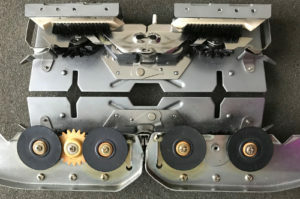 There is one on each side (magenta arrow on left, blue arrow on right), and to remove the ribber carriage off its bed, it in turn needs to be tilted forward prior to reaching the stops in order to clear them on either side. The carriage with the altered sinker plate in place in turn will then be used to replace rows that were to be knit with the ribber set to slip in both directions <– –> . In my sample it operated from the right, with the combined carriages (KC2), from left. 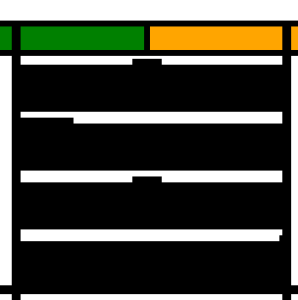 For consistency I am editing the original post and will continue to refer to the coupled carriages= KC2, the altered single bed one= KC1. 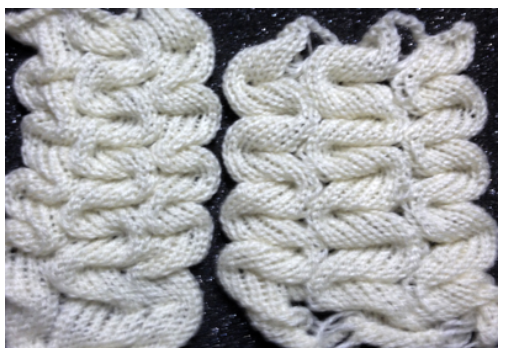 KC is the abbreviation commonly used in publications for Knit Carriage. 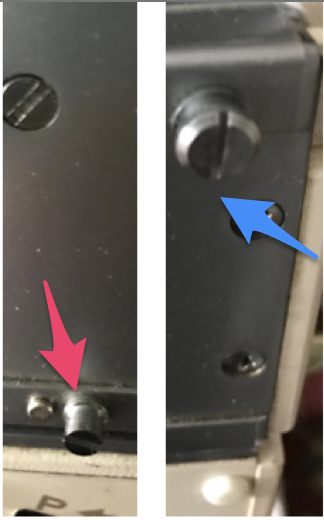 The change knob, which affects end needle selection, is marked on the KC as for I (end needle selection, indicated by black arrow) and II (cancel end needle selection). Initials KR in publications are often used to refer to ribber carriage in setting discussions. 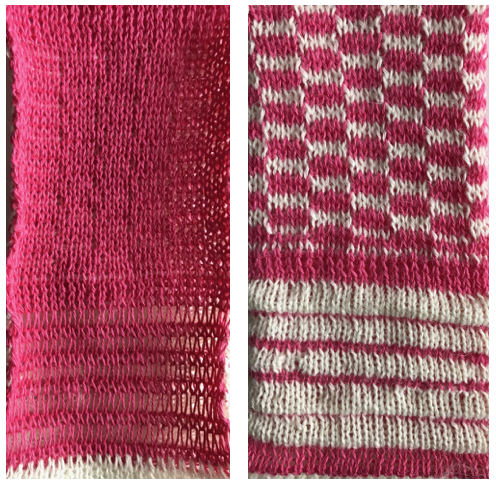 My beginning swatches were knit using ayab software’s ribber setting, which matches the KRC (2 color double jacquard separation) function in the unaltered 910. With my first try I made no effort to consider which color gets chosen first in the color separation (ayab = black, 910 = white). There is a limit as to how far the single carriage from the right (KC1) can travel on the needle bed to the left, because the combined carriages on the left (KC2) are held in place by the pin. It would be possible if needed to separate KC2 and push further out on the extension rail, but perhaps not practical, so there are some constraints on the fabric width able to be produced. 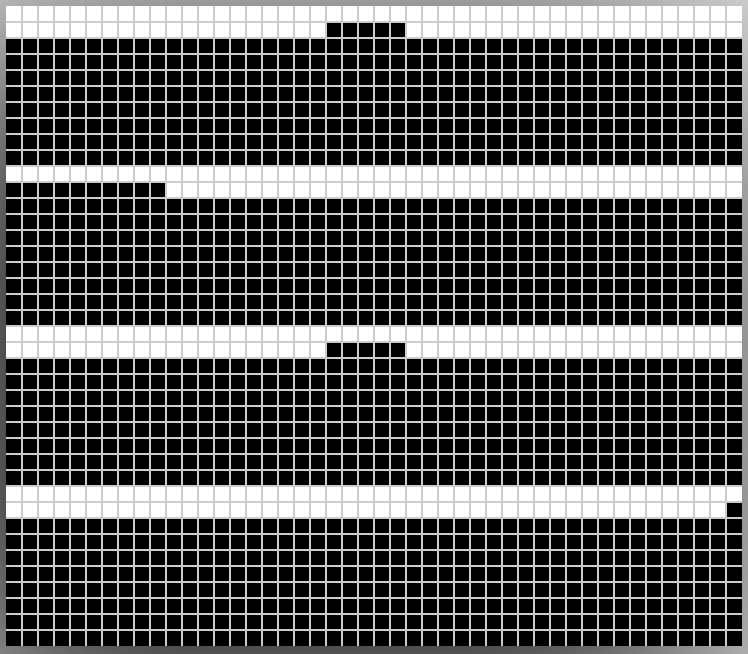 Knitting on 910 a single repeat may be programmed, start knitting with color intended for white squares, which will also serve as the solid backing color. For more similarities and difference between the original and the altered 910 see ayab diary post. To knit using Ayab: begin the knitting with the color intended to be used for areas marked in black squares, which will also serve as the solid backing color. Preselect first row from left to right with ribber set to knit (N/N), it will remain set that way for the remainder of the process. When on right, set coupled carriages (KC2) to slip <– –>, knit one row to left, both carriages stay on left. 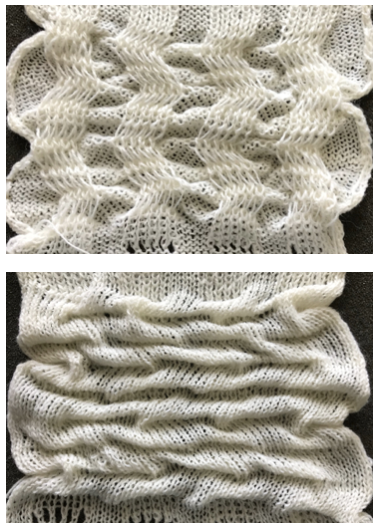 Knit the next 2 rows for DBJ using KC1 with altered sinker plate operating from right, using color intended for areas marked with white squares. The main bed only will knit. 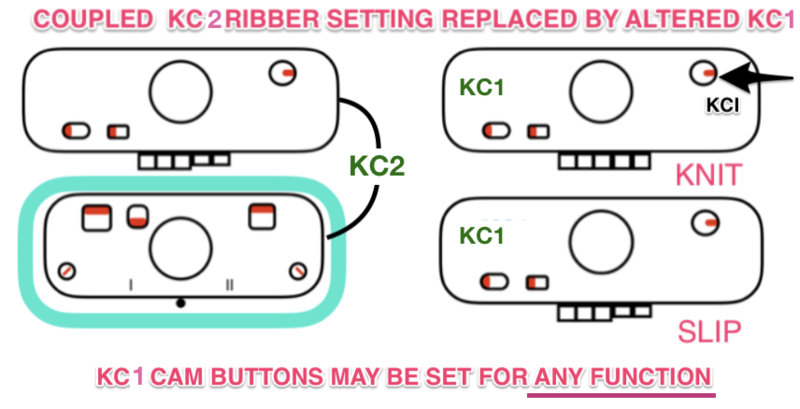 Set change knob to end needle select (KC I) to insure first and last needles in use knit. Return the KC1 to the right, on the extension rail, and knit next two rows with KC2 operating from left. Repeat, changing carriages and consequently colors every 2 rows. 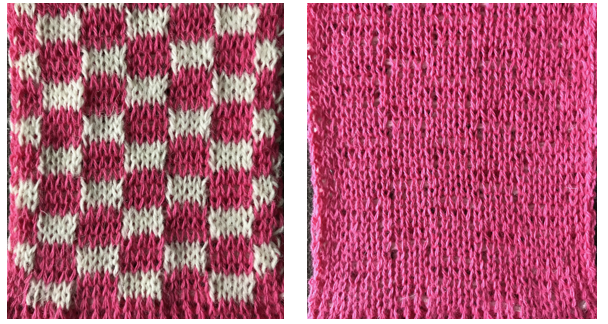 An expanded pattern repeat, planned for a larger test swatch. Here there are 2 black squares added at each end of the repeat to insure that those stitches on the top bed are knit on all slip stitch rows. 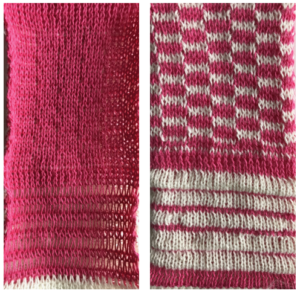 The new color is a wool, this time knit for 6 rows in slip stitch prior to sealing with 2 passes of the combined carriages with the contrasting color. 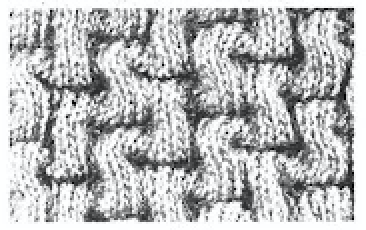 Single bed slip stitch rows appear on the knit side in color 2, the reverse, purl side is in a single color (1), and formed by the all knit rows. Its stitches are in turn elongated, since they are held and not knit while the opposite bed knits for multiple rows. 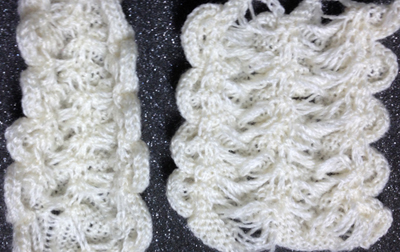 In the sample, the first and last stitch on each side were on the ribber, creating a single white slip stitch edging. One can adjust such details to suit. 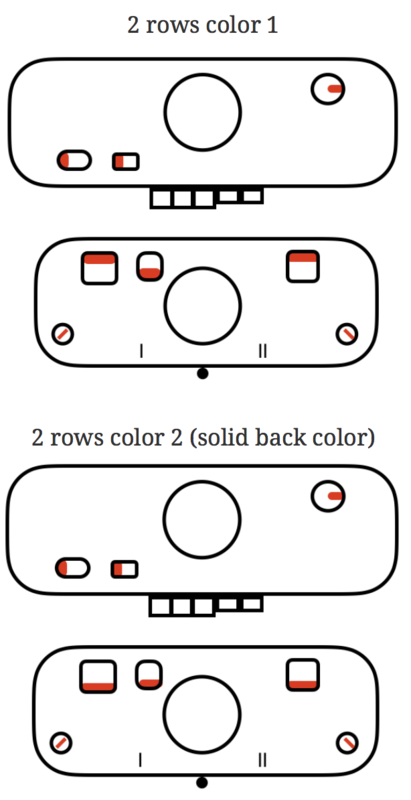 The first preselection row was made after cast on with both carriages (KC 2)set to knit, moving from left to right with color 1, where they stay. KC 1 with altered sinker plate was threaded with color 2, and begins from and returns to left hand side. 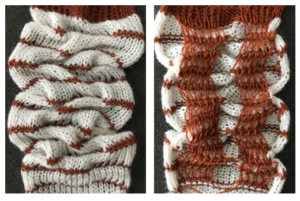 A detail shot of the edge: note the white, single, elongated stitch uppermost, and the pairs of contrast color ones in the “border” Designs with deliberate placement of white blocks representing each blister can be created. 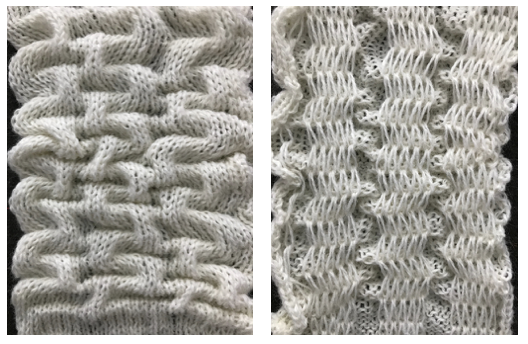 It is a good idea to test tolerance for each of the yarns involved as a hand tech or repeat such above before planning significantly longer repeats. 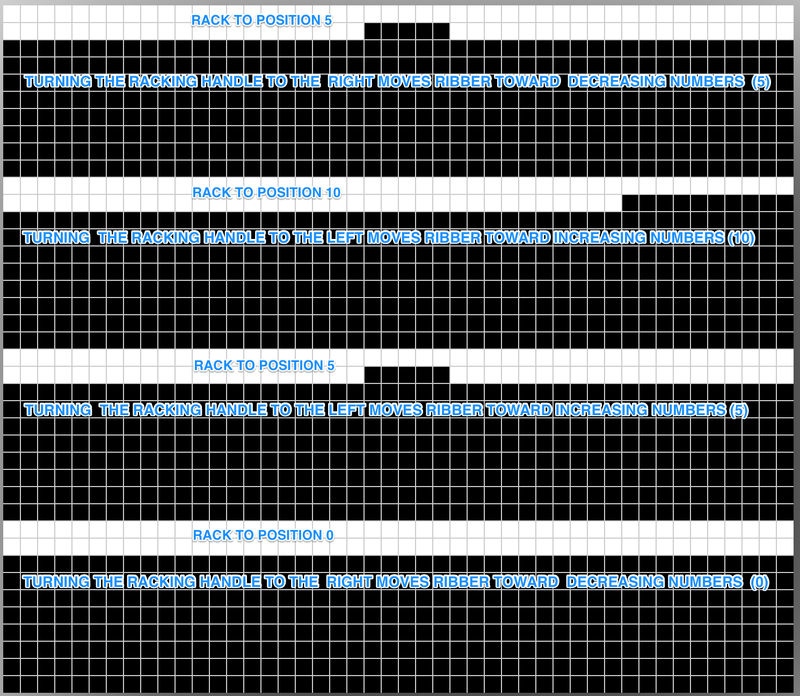 All black rows are required at intervals if the fabric is to be knit changing ribber settings for all knit rows. 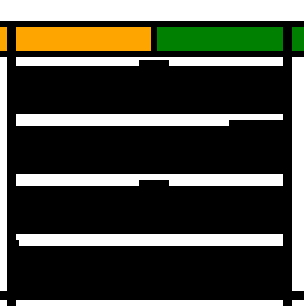 The same rows could be left blank if using carriages in the above manner, and lack of needle selection would be an indicator for switching to the double carriages for the 2 sealing rows, while not having to track the count for the slipped ones. 4/19/18 As is true in any knitting, things can go quirky. I began to have a single needle on the main bed not knitting on rows knit with the combined carriages, then ran into dropped stitches in racked groups. The problem was initially not with the software, but appeared to be a ribber issue, which after checking balancing was resolved. 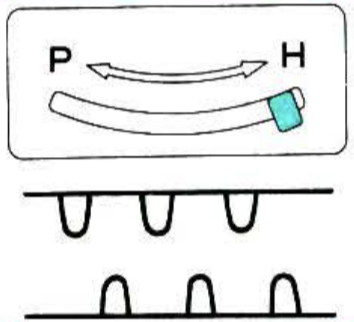 That said, remember that turning the racking handle to the left is toward increasing numbers on the indicator, to the right is toward decreasing numbers. For me that is counterintuitive. 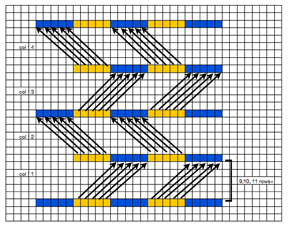 Mirroring the image again, and working with the repeat below can help with tracking racking movement even more. With the single dot on right, turn handle toward it, to the right, and the movement will be towards 0. 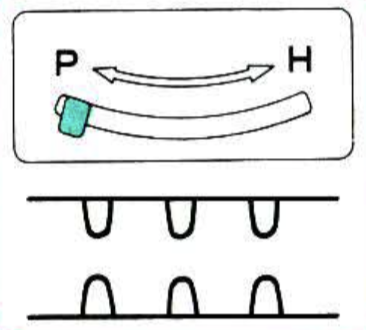 With movement of marking row to left, turn racking handle to left, toward 5, and so on.